We sit within the picturesque harbour village of Borth-y-Gest, which nestles on the shores of the Glaslyn estuary, approx. 1 mile from Porthmadog. Velog is a late Victorian, three storey house, built from the slate it stands upon. Velog sits on a hill amongst houses of similar age, set away from the hustle and bustle of the busy harbour front. We offer our visitors quiet, spacious, fully central heated accommodation, which has been sympathetically decorated and maintained throughout. 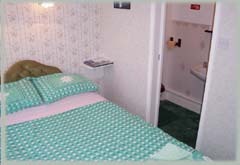 Velog's rooms are all double rooms with en-suite facilities. All rooms have tea and coffee hospitality trays, colour t.v's and are fully central heated. Velog has three different sized double rooms on the first floor for couples only, although singles can be accepted at the same room rate as couples. Unfortunately we have no twin bedded or family rooms available. All bedrooms have full sized double beds, and all rooms are fully en-suite with bath and or shower. All bedrooms are strictly non-smoking, and there is a strict no smoking policy throughout the whole of the house. 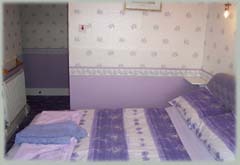 2 Double rooms - Sleep 1 or 2 guests with shower, Hospitality tray, remote colour t.v. 1 Double room - sleep 1 - 2 guests, with bath, Hospitality tray, remote colour t.v. All rooms have new divan beds, duvets and crisp ironed cotton sheets. All rooms are valeted daily, and it would be appreciated if the rooms could be vacated betwen 10am and 12 noon for this purpose.